We study the effect of environmental stress on early endosperm development. Endosperm is the primary source of nutrition for humans. The development of endosperm is highly sensitive to environmental factors such as heat and drought stress and results in reduced seed size. Our goal is to identify the genetic and epigenetic factors that determine this sensitivity so they can be altered to make grain development more resilient in cereals such as rice and wheat. Root traits are critical for drought adaptation. We are interested in elucidating the molecular mechanisms for adaptive root responses to water stress in wheat. Recent findings from this project are reported in Placido et al. 2013 in Plant Physiology. 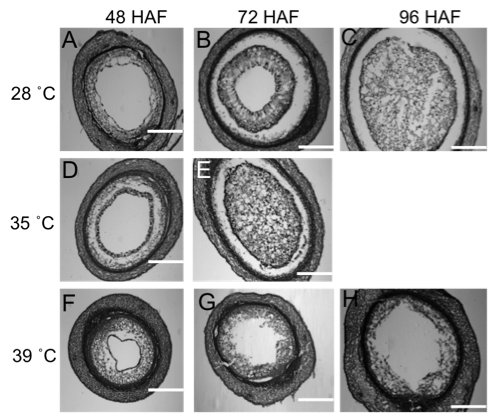 This paper describes the physiological consequences of enhanced root biomass under water stress in wheat. We are currently, attempting to identify novel genes and alleles from alien introgression in bread wheat from wild relative in collaboration with other laboratories. Our approach for this project is to use RNAseq to identify novel factors introduced from the wild accession and functionally validate candidate genes in wheat for their role in drought adaptation. The collaborative project is supported by the Daugherty Water for Food Institute at the University of Nebraska. Global-, regional-, and farm-level trends point to an increase in minimum night temperatures to be significantly higher than the rate of increase in maximum day temperatures. Increases in night temperatures significantly decrease the grain yield and quality of major crops such as rice and wheat. To ensure global food security, there is an urgent need to improve crop resilience to high night temperature stress-induced yield and quality losses. We are aiming to identify phenotypic diversity for high night temperature resilient in rice and wheat germplasm using image-based automated phenomics approaches in controlled and field environments. The goal is to build genome-to-phenome linkages using genome-wide association analysis and combine genetic variation information with large-scale transcriptomics and metabolomics. To this end, we are coupling genomics and phenomics outcomes within a quantitative, model-based framework. This multi-state (Nebraska, Kansas, Arkansas) project is funded by NSF EPSCoR T2 Award. 1. Chen et al., Heat stress yields a unique MADS box transcription factor in determining seed size and thermal sensitivity. 2016, Plant Physiology. 2. Folsom et al., Rice FIE1 regulates seed size under heat stress by controlling early endosperm development. 2014, Plant Physiology. Salinity is an important limitation for rice yields and results in estimated yield losses of 12 billion dollars annually. 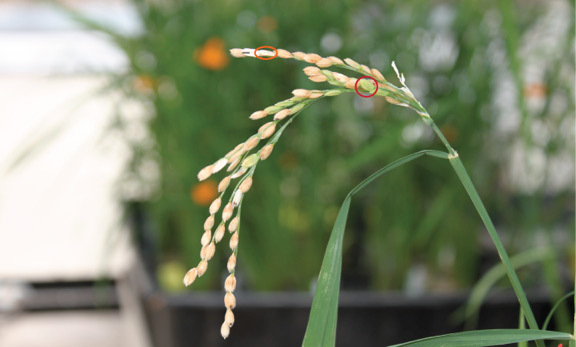 The goal of this collaborative NSF Plant Genome Research grant is to identify the genetic and physiological basis of salinity tolerance in rice. We are using the automated image-based phenotyping for dissecting the physiological responses for a diverse set of rice germplasm. The phenotypic information will be combined with genotypic data for the rice diversity panel for genome-wide association studies. Bioinformatics and computational biology approaches will provide new molecular insights that can be lead to development of salt-tolerant rice cultivars. Manhattan plot for the logistic growth-response association analysis in rice under salinity stress. 1. Walia et al., 2009. Comparing genomic expression patterns across plant species reveals highly diverged transcriptional dynamics in response to salt stress. 2. Walia et al., 2007. Genome-wide transcriptional analysis of salinity stressed japonica and indica rice genotypes during panicle initiation stage. 3. Walia et al., 2005. Comparative transcriptional profiling of two contrasting rice genotypes under salinity stress during the vegetative growth stage. 4. Campbell et al., 2015 Integrating Image-Based Phenomics and Association Analysis to Dissect the Genetic Architecture of Temporal Salinity Responses in Rice. 5. Campbell et al., 2017 Allelic variants of OsHKT1;1 underlie the divergence between indica and japonica subspecies of rice (Oryza sativa) for root sodium content.